Debt is inevitable, whether for personal or business use. Having debt is normal in some specific circumstances but having debt that you can’t handle will cause you great trouble. 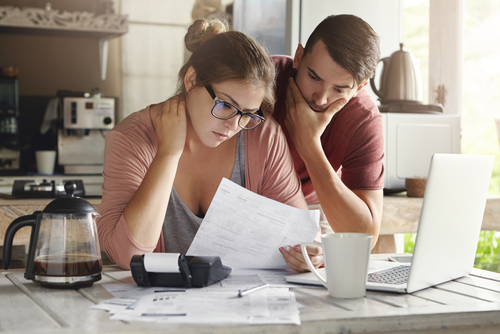 You should know how to recognize the warning signs of a debt problem so you may be able to handle it and take actions before it becomes worse. If you don’t have a savings account or if you can’t even save a little money on your own because of the need to pay your debts, that’s a bad sign of a debt problem. When you’re in dire need of cash but you have no savings, you can apply for loans at online lending site such as Check Into Cash. Your paycheck can be used for your bills, debts, savings, emergency, or any other kinds of funds. However, if your paycheck is not maximized to save money, then you probably aren’t managing your money well, or you are stuck with paying debts. Moreover, if you’re living below your paycheck just to pay off your debts, instead of saving, then you are having a severe debt problem. You need to manage and control your debt as early as now so you can start to acquire the benefits of saving money. For instance, when an emergency comes, and you don’t have any money or savings to spend, you will start to begin another debt, and this will make your debt even worse. Overdue accounts result when you don’t have enough money in your budget to pay for your debts which result in paying late. It’s because most of your income is consumed by paying your debts. Moreover, late payments also affect your reputation and will lead on black marks on your credit history. When you always pay late, you can be rejected for your new loans, mortgages and credit cards. Every rejection will be recorded by the lending institutions and will greatly affect your future loans or debts. Having regular issues over an extended period and overdue accounts recorded at a particular financial institution will damage your reputation, thereby not warranting loans next time you need it. If you have credit cards and your account is past due, you’ll be paying the penalty or the late fee and increased interest rate. If it continues, you’ll end up having more debts due to interest rates. Moreover, every late payment is added to your credit report and your credit score may drop. If it gets worse, you can’t be able to make purchases on your account. When you’re only capable of paying the bare minimum, then you are already in trouble. By paying only the minimum, you will be burdened for a long period to finish your debt. It may seem the easiest way to pay off a debt, but the longer you pay, the higher interests are being spent. To finish your debt faster, pay the minimum for the first year then increase or double your payment every year. In this way, you can make your debt lower and get paid off much quicker. Getting into more debt to pay off another debt can be a significant problem. It’s not a solution you resort to as it’ll just give you additional liabilities to worry on. Taking out new loans and credit cards to pay your bills or creditors only adds to your debt balances. You must know that you are making the wrong move which is not suitable for solving your financial problems. Consolidating loans can help you to get out of old debt but enter a new one, so there’s still no difference. It will add more interest and will result in long-lasting debt. Don’t ever engage on bigger debt to pay your existing smaller debt. For sure, you don’t want your debt to become higher over and over. If you realize you’re already engaging in this debt problem then find your way out as early as you can. If you’re experiencing the stated warnings signs, then it’s a sign you’re getting out of control with your debts. You need to take action as soon as possible to avoid sinking altogether. When you know the warning signs, then you can immediately solve it to avoid piling up more debts.